Listening to: "Sonata for keyboard in D minor, K. 434 (L. 343): P.498"
I finished all of my work for the month about thirty minutes ago. The only thing I didn't do was check for commonly misused words in one of my manuscripts. I didn't do this because as I was composing an email to the author, I accidentally sent it, which meant she expected the manuscript to follow shortly. So I went ahead and just sent it, along with a complete email. I dare say that's pretty good work. 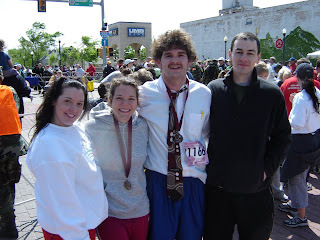 A team of us editors ran in the OKC Marathon Relay last Sunday, and we were awesome. Granted we came in AFTER teams with names like "Eating Your Dust" and "Not Gonna Make It," but we DID finish, and as previously stated, we were awesome. Just check out Ben's get up and try to tell me we weren't. I've recently found that I can create composer stations on pandora.com, so I'm trying out new dudes: started with Beethoven, then Bach, then Brahms, and most recently Rachmaninoff (or Rachmaninov...which is it?!). I've never listened intently to classical music (thought about what I was listening to). I've never studied it. I still don't know much, but I think I'm picking up on simple things. The only bad thing is pandora doesn't play ONLY the composer chosen to represent the station. Still, I'm getting the general sound out of each artist, which I like. And it's great background music for the day. I've just started my final book for the month. "I'll Never Forget You." This is the story of a young GI and a Japanese model. Love is in the air, people. I don't often read romances written by men. I'll try to remember to update. I had my montly conceptual discussions with senior editor CW yesterday. I believe I redeemed last month's poor conceptual discussions wherein he was using me as an example of "good" conceptual discussions, and I bombed. CDs are when I talk to CW about the books I've been editing that month. I usually try to bring two or three big ideas that I'm presenting to each writer to the table and talk about how I hope to help the author maket his or her book better. I was able to dig a little deeper with a few of my books this month, so it went well. I got to talk about dialogue structure and conflict and story arc, etc. I like talking about these things (not just redundancy and punctuation, and blah blah blah). It's easy to go into conceptuals and have critcisms, but what I think he's looking for are solutions to problems. I like being able to bring these to the table, because I have good solutions when I have the time to think about them (I give Collin the credit for teaching me to sit and really think about my work). It's just sometimes difficult when you're dealing with ten books in a really hard month. This month has been good. I am thankful.